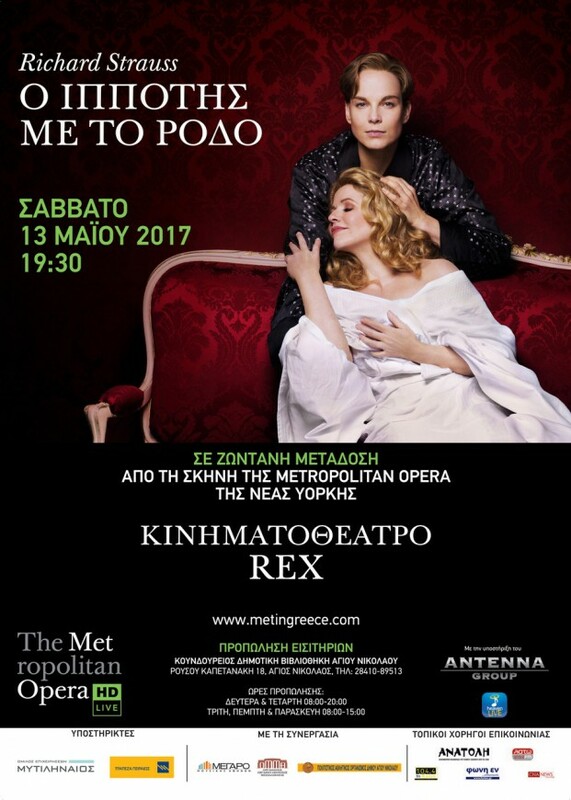 Το βραβευμένο πρόγραμμα «The Met: Live in HD», μετά την φαντασμαγορική όπερα «ΕΥΓΕΝΙΟΣ ΟΝΙΕΓΚΙΝ» με την συγκλονιστική AnnaNetrebko που καθήλωσε για άλλη μια φορά το κοινό με την μαγική ερμηνεία της, παρουσιάζει σε όλες τις αίθουσες του δικτύου ΑΝΤΕΝΝΑ στην Ελλάδα και την Κύπρο, το ρομαντικό αριστούργημα του Strauss «Ο ΙΠΠΟΤΗΣ ΜΕ ΤΟ ΡΟΔΟ». Η πρώτη νέα παραγωγή της Met από το 1969 του ρομαντικού αριστουργήματος του Strauss διευθύνεται από τον κορυφαίο μαέστρο James Levine και σκηνοθετείται από τον Robert Carsen, του οποίου η πιο πρόσφατη σκηνοθεσία στη Met ήταν το επιτυχημένο ανέβασμα του Φάλσταφ το 2013. 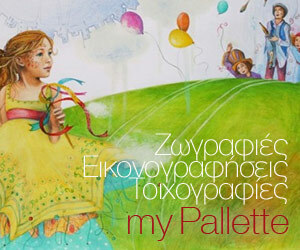 Η Renée Fleming ερμηνεύει για τελευταία φορά στην καριέρα της το ρόλο της Μαρσαλίν, έναν από τους ρόλους που την χαρακτήρισαν μέχρι σήμερα. Απέναντι της είναι η επίσης εκπληκτική Elīna Garanča στις πρώτες της παραστάσεις στην Αμερική στον ιδιαίτερο ρόλο του Οκτάβιαν, του παρορμητικού νεαρού εραστή της που χαρακτηρίζει και τον τίτλο του έργου. Η εκπληκτική διανομή περιλαμβάνει ακόμα τον Günther Groissböck ως Βαρόνο Οξ, την Erin Morley ως Σοφί, τον Marcus Brück στο ντεμπούτο του στη Met ως Φανινάλ και τον εξαίσιο Matthew Polenzani ως Ιταλό Τραγουδιστή. Ο Ιππότης του Ρόδου είναι μια συμπαραγωγή με το Royal Opera House, Covent Garden, και το Teatro Regio di Torino. Ο Ιππότης με το Ρόδο αναφέρεται στον έρωτα με μια κωμική διάθεση και παράλληλα με μια πλοκή που θέλει να προκαλέσει το κοινό. Η 32χρονη Μαρσαλίν έχοντας περάσει μια θυελλώδη νύχτα με τον 17χρονο Οκτάβιαν, υποδέχεται στο σπίτι της τον επαρχιώτη εξάδελφο της Βαρόνο Οξ. Ο Βαρώνος Οξ ακολουθώντας τα έθιμα της εποχής θέλει να στείλει με έναν νεαρό ευγενή το ασημένιο ρόδο στη μνηστή του Σοφί, ως δείγμα αφοσίωσης. Ο νεαρός Οκτάβιαν δέχεται να κάνει την αποστολή για χάρη του Βαρώνου Οξ και συναντά την Σοφί. Μόλις όμως οι δύο νέοι συναντιούνται ερωτεύονται κεραυνοβόλα και η Σοφί αποφασίζει να μην παντρευτεί τον Οξ. Vienna, during the last years of the Habsburg Empire. The Marschallin, Princess von Werdenberg, has spent the night with her young lover, Octavian, Count Rofrano. He hides when a page brings breakfast, then again when loud voices are heard in the antechamber. The unexpected visitor is the Marschallin’s country cousin, Baron Ochs auf Lerchenau. Bursting into the room, he brags about his amorous conquests and his upcoming marriage to Sophie von Faninal, the young daughter of a wealthy bourgeois. When he asks the Marschallin for advice as to which cavalier could present Sophie with the traditional silver engagement rose, she suggests Octavian—who suddenly, to avoid discovery, emerges from his hiding place disguised as a chambermaid. The baron instantly starts to make advances towards “Mariandel,” who quickly makes her escape as the room fills with the daily crowd of petitioners and salespeople. Among them is a singer, whose aria is cut short by Ochs’s wrangling with a lawyer over Sophie’s dowry. The Baron hires a pair of Italian intriguers, Annina and Valzacchi, to locate the shy servant girl. When the room is cleared, the Marschallin, appalled by the thought of the rude Ochs marrying the innocent young girl, muses on her own waning youth. The returning Octavian is surprised to find her in a distant and melancholy mood. He passionately declares his love but she can only think about the passing of time and tells him that one day he will leave her for a younger woman. Hurt, he rushes off. The Marschallin tries to call him back, but it is too late. She summons her page and sends Octavian the silver rose. On the morning of her engagement, Sophie excitedly awaits the arrival of the cavalier of the rose. Octavian enters and presents her with the silver rose on behalf of the Baron. Sophie accepts, enraptured, and the two young people feel an instant attraction to each other. When Ochs, whom Sophie has never met, arrives, the girl is shocked by his crude manners. Ochs goes off to discuss the wedding contract with Faninal, and Sophie asks Octavian for help. They end up embracing and are surprised by Annina and Valzacchi, who summon Ochs. The outraged Octavian grazes the Baron’s arm with his rapier and Ochs melodramatically calls for a doctor. In the ensuing confusion, Sophie tells her father that she will not marry the Baron, while Octavian enlists Annina and Valzacchi to participate in an intrigue he is hatching. When Ochs is alone, nursing his wound with a glass of wine, Annina, sent by Octavian, appears with a letter from “Mariandel,” asking Ochs to a rendezvous. Intoxicated with his own charm, the Baron is delighted at the prospect of a tête-à-tête. When he refuses to tip Annina, she determines to get even. At Octavian’s instigation, Annina and Valzacchi prepare the back room of a dingy inn for Ochs’s rendezvous. Before long, the Baron and “Mariandel” arrive for a private supper. As she coyly leads him on, grotesque apparitions pop out of windows and secret panels, terrifying the Baron. Annina, disguised as a widow, runs in crying that Ochs is the father of her many children. When the police appear, Ochs claims that “Mariandel” is his fiancée. The arriving Faninal, furious at his future son-in-law’s behavior, summons Sophie to set matters straight, then faints and is carried off. At the height of the confusion, the Marschallin enters. Octavian takes off his disguise and the Marschallin explains to Ochs that it was all a farce. He finally admits defeat and leaves, pursued by the innkeeper and various other people who all demand payment of their bills. Left alone with Octavian and Sophie, the Marschallin laments that she must lose her lover so soon, but nevertheless accepts the truth. She gives the bewildered Octavian to Sophie and quietly leaves the room. The young lovers realize that their dream has come true. The opera is originally set in Vienna in the 1740s. Genuine historical references are merged with fictitious inventions (like the “noble custom” of the presentation of the silver rose to a fiancée, which never actually existed) and anachronisms (like the Viennese Waltz, which did not yet exist at that time). It’s a mixture that creates a seductive mythical landscape, a ceremonious and impossibly beautiful Vienna-that-never-was. The Met’s new production moves the setting to the last years of the Habsburg Empire. Premiere: Court Opera, Dresden, 1911. Set in an idealized Vienna of the past, Strauss’s most popular opera concerns a wise woman of the world who is involved with a much younger lover but ultimately forced to accept the laws of time, giving him up to a pretty young heiress. Hofmannsthal’s fascinating libretto deftly combines comedy, dreamy nostalgic fantasy, genuine human drama, and light but striking touches of philosophy and social commentary. Strauss’s magnificent score, likewise, works on several levels, combining the refinement of Mozart with the epic grandeur of Wagner.